As you continue on your journey, visit the Monkasel, the original KRI Pasopati 410 submarine next to the Surabaya Plaza shopping center. It is 76.6 meters long and 6.3 meters wide. 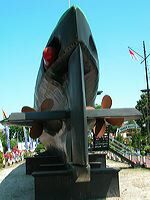 It was moved from Ujung to this location on July 1st, 1995, after the museum was officially opened by Arief Kushariadi, the Naval Commander of the Republic of Indonesia on June 27, 1998. KRI. Pasopati with 410 side number belongs to SS type whiskey class built in Vladivostok Russia in 1952. It has been with Indonesia Navy since 29 January 1962 and carried out dutief to destroy enemy line, to be surveillance and acts as silent raids. KRI. Pasopati bought ctivelly for independence and national supremacy in the past. It was the front line during Trikora Operation, gave psicological presure so that west Irian could be gain back and other important operation. The following month, on July 5, 1998, it was opened to the public as a marine tourist destination. Boats and a diorama also complete the monument, which also functions as a museum. 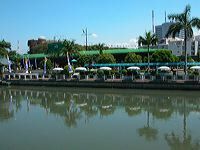 The visitors who want to travel by boat along the Kalimas River to view the monument can launch from ‘"Prestasi Park" behind the Grahadi Governor Mansion.